DESPITE ALL OUR NOBLEST INTENTIONS AND highest hopes, the beginning of 2019 has admittedly been a little rough. As of the writing of this article, it’s still snowing in many northern states (Punxsutawney Phil’s premonitions be damned), a certain Commander-in-Chief is (still) waging micro-aggressions on everyone from national news outlets to dead senators to entire nations and Key West has had more cold snaps than Antarctica has penguins. In times like these, it’s critical to engage in self-care — and we don’t mean hunkering down with a case of Whiteclaw, an entire pizza and the newest season of whatever you’re binging these days. Sometimes, self-care means actual, mindful activity that forces you to refocus and revitalize. And — we know this might shock you — Key West does purposeful relaxation just about as well as it does drunken debauchery. Anticipating that we need a little TLC now more than ever, the second annual Key West Yoga and Wellness Fest is set to invade Key West this weekend, utilizing the beauty and magic of our island paradise to foster and celebrate a healthy and conscious lifestyle for all. The owners of Anahara Spa, Green Pineapple and the Yoga Sanctuary, along with local and imported yogis and wellness experts, have combined their healing powers to bring four full days of mindful self-indulgence to Key West in the form of a festival designed to bring us all closer to ourselves. Although last year’s festival was a great success, organizers Tracy McLellan and Jennifer Hulse Russo are committed to making this year even more dedicated to serving a wide variety of wellness goals. “Key West people are really resilient,” says McLellan, the owner of Anahara Spa. “Everyone is amazingly strong, but when we first did the festival last year, people were able to come together and learn different mental, physical and spiritual resources that they could use in their dayto day lives, which I thought was really neat. They met new people and made connections in a healthy social environment. 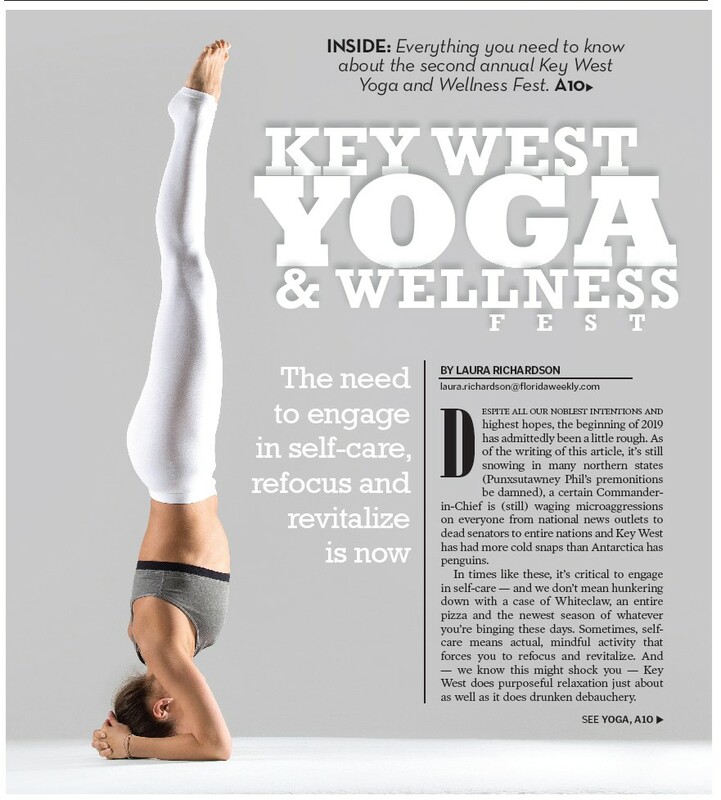 The Key West Yoga and Wellness Fest launches in classic Key West style from 5:30-8 p.m. Thursday, April 4, with a lavish kick-off party at the Green Pineapple Wellness Center (home to the serene Yoga Sanctuary) and Anahara Spa, at 1130 Duval St. Attendees will enjoy live soulful music, light bites, organic beverages and VIP access to mini-spa treatments and relaxation stations. The real soul-searching happens from 9 a.m. to 7 p.m. Friday, April 5, when the main event takes place at Higgs Beach and the White Street Pier on the shores of the Atlantic Ocean. The picturesque venue provides the idyllic backdrop for a celebration of mind, body and spirit. Attendees will be able to participate in a variety of yoga classes and workshops for all ages, listen to inspirational and educational speakers, enjoy delicious and nutritious organic food, explore a large vendor marketplace and vibe to live music on the main stage. And if 9 a.m. isn’t early enough for you, local outdoor activities darlings Lazy Dog invite you to a Paddle Fit yoga class from 8-9 a.m.
Friday culminates with a dance party under the moonlight hosted by DJ Drez, famed yogi, sound engineer and turntablist. The party starts at 7:30 p.m. and is free for all Yoga and Wellness Fest participants. Members of the non-festival public can attend for $30 (payable at the door). The halcyon festivities continue on Saturday with another full day of classes and workshops. Participants can attend “flight school” with Raghunath Cappo and play with handstands and inversions under the careful watch of trained yoga professionals or experience energetic musical classes taught by Dawn B. Feinberg, widely recognized as one of the most charismatic and highly respected yoga teachers in South Florida. Newcomers to yoga can take a fundamentals class to learn the basics or a gentle, restorative class designed for any age group. There will be opportunities for the curious to learn about topics related to whole-body wellness, from nutrition and ayurvedic medicine to chakras and essential oils. Therapists will be on hand for relaxing massages, and the Festival Marketplace will bustle with an array of vendor booths offering yoga and fitness apparel, organic products, local art, aromatherapy, crystals and stones and healthy and organic food. Children 12 and under accompanied by a parent are welcome at Saturday’s events. For $10, baby yoginis will have access to a children’s zone where they can explore yoga, meditation and movement classes and participate in a wide variety of arts and crafts. Events on Sunday, April 7, begin at 9:30 a.m. at the Southernmost House with an invigorating musical yoga experience taught by local yoga rock stars Tara McCabe and Gretchen Mills and accompanied by DJ Drez. Participants will move through an inspiring asana with a rocking soundtrack, followed by fresh juices and light bites surrounded by the shimmering waters of the Atlantic Ocean. Festival founders hope the beachfront venue, aside from providing a beautiful and serene space, will also serve to cement Key West’s spot on the map as a yoga and wellness destination, tapping into a huge and ever-expanding market of yogis and wellness-conscious individuals from all over the world. “Though we have an amazing number of local yoga and wellness instructors, the quality of the yoga instructors and musicians we’re bringing in from out of town says a lot about our progress as a festival,” Russo says. “We have DJ Drez, a big star in the yoga world, coming in from California to DJ classes and host our dance party Friday night. He brings a very positive energy and dance glow. He’s amazing. By the same token, the variety of classes and workshops is also designed to appeal to out-of-town yogis looking to find balance far from the concrete jungle. Does the phrase “adho mukha s’va¯na¯sana” give you anxiety? Have you not been able to touch your toes since high school? Don’t be intimidated — every yoga practitioner has to start somewhere. Why not let your somewhere be paradise? “What I love about our festival is that we want everyone who comes to feel comfortable,” McLellan explains. “You don’t have to be a super yogi. People who want to try a yoga class but aren’t confident can ease into it. “And there are other options as well as yoga. We have wellness classes and workshops all day every day. We’ll have the Raw Machine food truck set up so people can try different food and drinks. There will be meditation classes for people looking to take it slow. And if you need a more noble reason to slow down and take care of yourself for a weekend, a portion of the festival’s proceeds will benefit the Children’s Yoga and Wellness Initiative, a local 501(c)3 organization whose mission is to bring yoga and wellness programs to Keys youth and the school systems. “Introducing children at a young age to tools that will help them live more peaceful and balanced lives is how we can all help heal the world,” Russo says. Presenting sponsor for the Yoga and Wellness Fest is Watergen USA, an innovative company working to solve the world’s drinking water crisis by creating fresh, clean water directly from air. Watergen USA will demonstrate its cutting-edge technology at the fest and provide healthy drinking water without the use of disposable plastic bottles that harm our environment. Attendees are encouraged to bring refillable water bottles or to purchase reusable bottles at festival events. Details on the weekend’s events and tickets are available at www.keywestyogaandwellnessfest.com. If you want to get maximum bang for minimum buck, consider the VIP Festival Pass: $250 gets you a VIP gift bag and access to all of the events, including a handful of VIP-only activities, like Thursday’s Walking Meditation at the Key West Butterfly & Nature Conservatory and Friday’s Kirtan session with Raghunath Cappo at the Ernest Hemingway Home & Museum. (For the uninitiated, Kirtan is an ancient form of yogic chanting.) VIPs also have exclusive access to the VIP lounge at Sunday’s dance party, which includes light bites and organic wine and beer. General admission tickets for the daytime events run $50 per day on Friday, Saturday and Sunday. Advance ticket purchase is recommended, especially for VIP access, but tickets can also be purchased at the gates (subject to availability). For more information, contact Jennifer Hulse Russo at 305-890-6472 or jennifer@keywestyogafest.com. 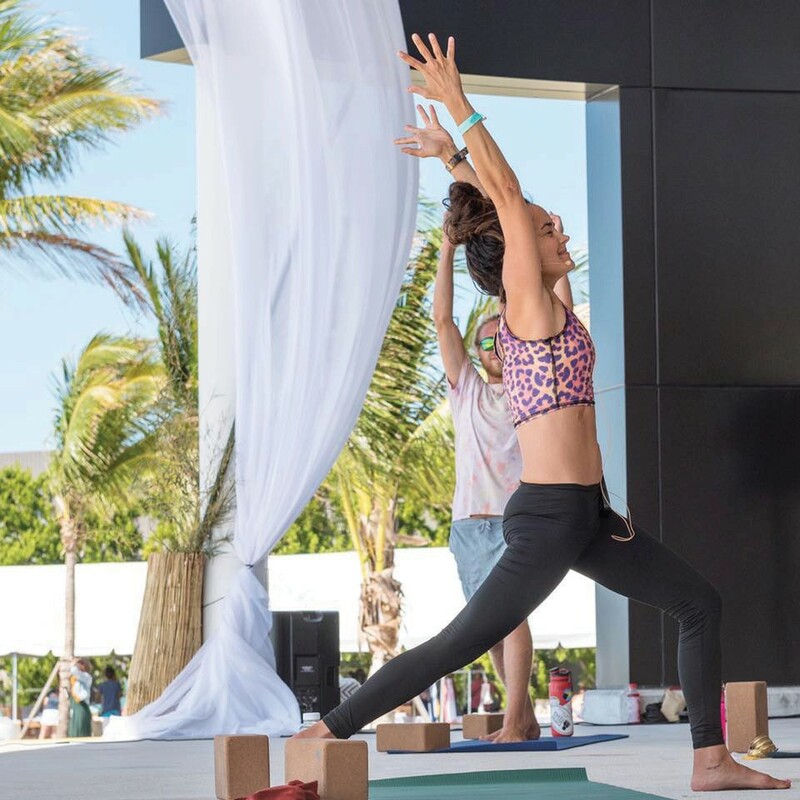 For the boss babes behind the Key West Yoga and Wellness Festival, taking the time to slow down and disconnect to reconnect is necessary for everyone, not just VIPs and daily yoga devotees. “Everyone struggles for balance at times, myself included,” McLellan says. “This weekend, I’m most excited about people being in their moment and just enjoying it — not on their cellphones. “It’s about everybody connecting back into nature, surrounded by water and the sound of the ocean. It’s about putting yourself on your priority list — allowing yourself to really enjoy the day, free from stress and guilt and anxiety.